Cornwall Iron Furnace is a museum located in Cornwall, Lebanon County Pennsylvania and is part of the Pennsylvania Trails of History travel tour. It's the only surviving intact charcoal cold blast furnace in the western hemisphere. It was open for business from 1742 until 1883 and was one the largest iron producing plants east of the Mississippi River. It's a typical furnace, one of many that used to dot the Pennsylvania countryside in the 18th and 19th centuries. Once the plant was in full operation, many homes, artisans' shops, stores, schools, churches, and the home of the wealthy ironmaster were built around it. Cornwall Iron Furnace was once a thriving and self-sufficient village all on it's own. In the 1730's, Peter Grubb, a stone mason, began mining nearby. 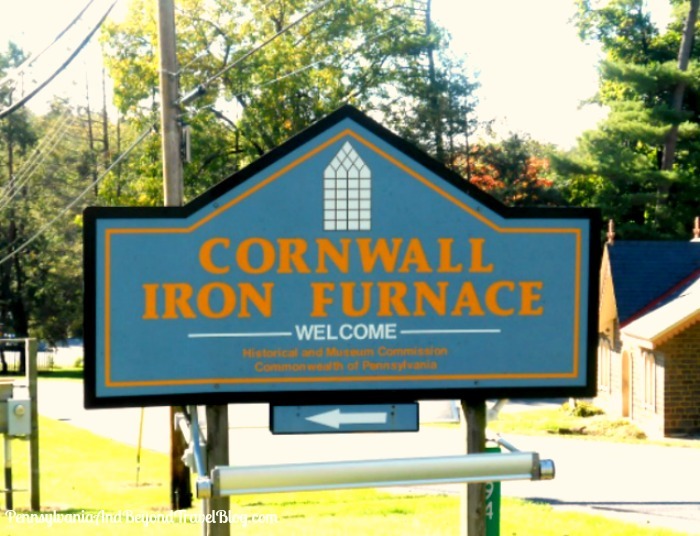 In 1742, Mr. Grubb established the furnace, naming it Cornwall after his father's birthplace in Cornwall England. In it's hay-day, the facility produced one-seventh of the world's iron and was a leader in the industry. When Mr. Grubb passed away in 1754, the business was passed onto his sons, Curtis and Peter. By 1798, the Grubb family sold the business to Robert Coleman, a successful businessman who eventually became Pennsylvania's first millionaire. Cornwall Iron Furnace remained in business until 1883, when newer and more efficient iron furnaces sprung up across the nation. These new iron furnaces were fueled by anthracite coal which made made this type of furnace obsolete. The furnace was abandoned until it was donated to the state of Pennsylvania in 1932 by Margaret Coleman Freeman Buckingham, the great granddaughter of Robert Coleman. The state has turned the property into a historical museum. When visiting, you'll want to follow the signs to the entrance of the Visitor's Center and pay your admission fee at the gift shop. Once we paid our admission, they led us down a hallway where we sat in a room and watched a nicely produced film which gave you the history on the place, along with the various owners who owned it. The film was approximately 20-30 minutes in length. Our tour guide met us as soon as the film was over and took us outside to show us the old Roasting Oven where they used to lay down alternate rows of iron ore & charcoal. This was done to remove the stinky sulfur from the iron ore. They believe that the Roasting Oven was constructed in the early 1800's when the mine was beginning to yield a lower grade of ore.
We then headed into the main Furnace Building which was built during the mid-1800's when the furnace was remodeled and enlarged. If you look closely at the building, you'll notice that it was done in a Gothic Revival style (you'll really notice that by looking at the Gothic windows). Charcoal, iron ore and limestone were introduced into the furnace in the charging room on the upper level. The blast equipment, which supplied air to the furnace, is located on the next lower level. This is believed to be the sole surviving example of this type of machinery. When you're on this level you'll see that old wheel and they will actually turn it on during the tour which is really cool. (first photo below). The casting room is located on the lowest level and is where molten iron was released from the furnace to be cast into pig iron or other cast iron products (photo above). Typical iron products from that era included cast iron skillet, cannon balls, horse shoes, cannons, railroad tracks, etc. A cart would be wheeled into this room, the goods loaded up onto the cart and then it was wheeled back out. Everything was done by manual labor. There are several other buildings located on the property: Blacksmith Shop, Wagon Shop, Abattoir, the Stables, Manager's House/Office Building, Open Pit Mine, Minersvillage, Ironmaster's Mansion and the Paymaster's Office. The majority of these are NOT open to the public so we didn't get to tour them. The Paymaster's Office was used when the furnace was in operation to hand out the "pay" to the employees. It sits right across the street to the main furnace building and visitor's center. It's now being used as an art studio. (shown above). Once we were done with the guided-tour we headed back into the visitor's center to do our own self-guided tour through their little museum section. You'll see a few exhibits and displays set up, so that you can learn more about Cornwall Furnace, the owners and the people who lived and worked there. You can go through this section at your own leisurely pace. Once done, head into the gift shop to do your souvenir shopping. The historic Cornwall Iron Furnace Museum is located on 94 Rexmont Road (corner of Boyd Street) in Cornwall Pennsylvania. It's open year-round but closed on Monday, Tuesday and all holidays except for Memorial Day, Independence Day and Labor Day. The hours of operation vary throughout the year, so please visit their website for current information and driving directions. Cornwall Furnace Historical Marker - Built by Peter Grubb. Operated from 1742 to 1883. Note: All photos used in this travel feature are copyright Pennsylvania & Beyond Travel Blog. Each photo is clickable. You can click on the photo and it will automatically open up in a new browsing window and in an enlarged size, so that you can view all of the smaller details up close. I am very glad that this example of an iron furnace has been preserved as a historical monument. I love the trim on the paymaster's office - It looks like a gingerbread house!